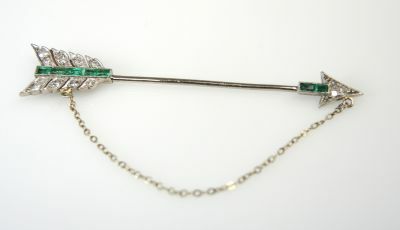 A beautiful Edwardian platinum and 18kt white gold jabot pin featuring 7 straight baguettes medium intense green emeralds, 0.42ct and 13 single cut diamonds, est. 0.20ct (SI clarity & H-I colour). A jabot pin is similar to a tie pin and was origianlly worn in the front of ruffled collars.